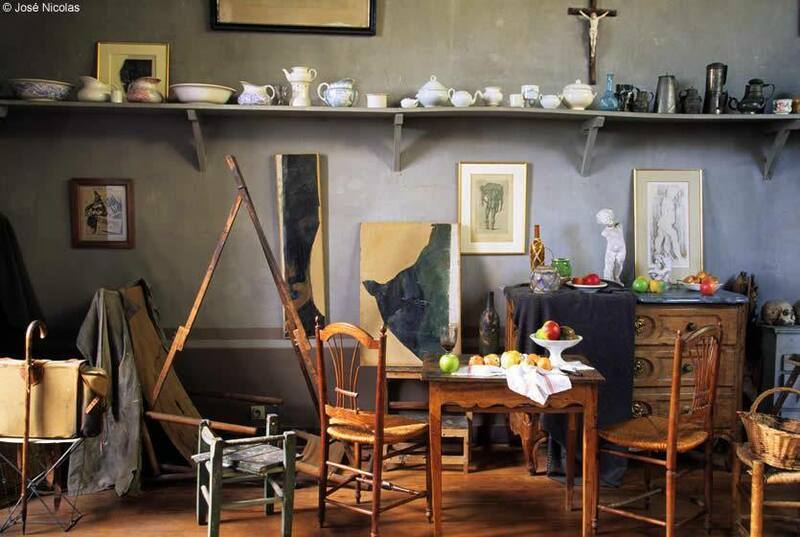 Inside Cezanne's studio. Note his famous props he used for years, a bottle, vase, cup. You can see an unfinished painting of Sainte Victorire, the neverending muse of Cezanne. He painted the mountain, again and again, to capture all its splendor. Paul Cezanne painted about 800 pounds of apples in his life. He obviously never tired of them, just like Monet unceasingly painted flowers. As a young boy exploring the countryside, Cezanne was a good friend to Emile Zola, the future French author. As a boy, Zola was taunted, teased and bullied by his classmates. Zola, a poor young boy whose father had prematurely died, was grateful to have a friend in Cezanne. He asked his mother what he could possibly give to someone who had been so kind--who had tangled with the bullies who pestered him. His mother, having nothing much else to give, offered him an old basket. 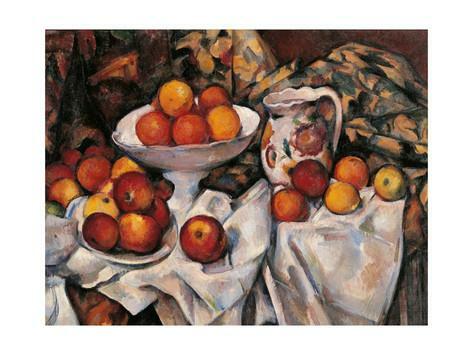 Zola promptly put a few apples in the basket and gave it to Cezanne as a token of his gratitude. The apples, probably a last minute decision from a young boy to throw in a basket, were the sparks that led to a resurrection in still life painting. Through the years, Cezanne always kept the basket in his studio. 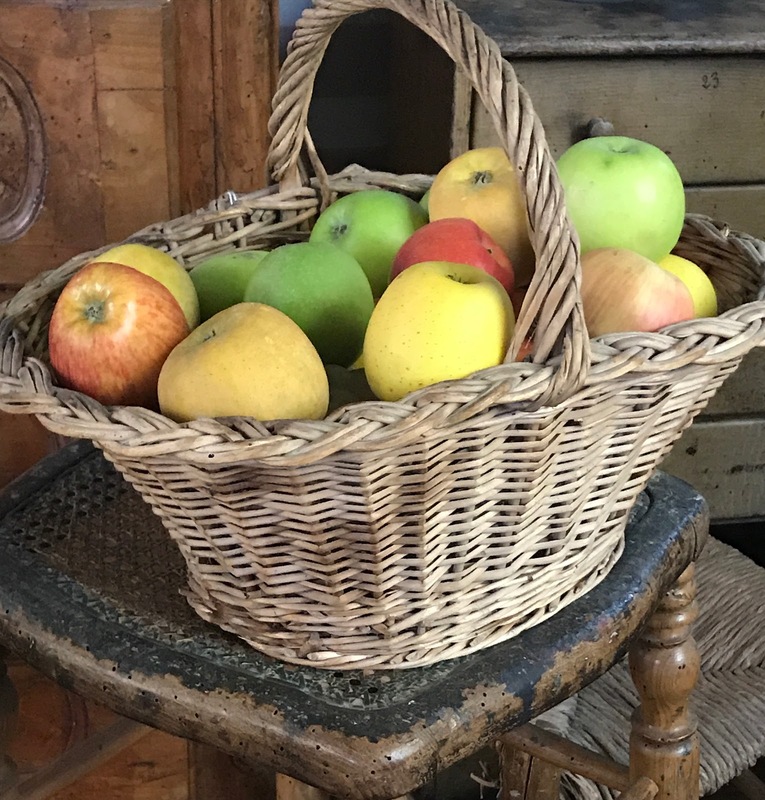 And if you visit, there are a few small piles of apples dotted around the room--just to remind you of the endless beauty and fascination he had with the simple apple. With a few props that he painted for thirty years, including the ubiquitous apples and sometimes a few other fruit, Cezanne changed the journey of art. In a way, apples brought him much acclaim. Matisse, Picasso, and others noticed how Cezanne placed those apples--the colors, space, and how they seemed to be haphazardly placed in time. Yet, Cezanne painted balance in an unbalanced world (or painting). He bridged Impressionism to Cubism, and is known as "the father of modern art." It is the same as in real life: the small, seemingly perceptible connections in life (like apples) loom large. A childhood gift from an appreciative friend changed both young boys' lives. Zola experienced true friendship and knew he could depend on Cezanne to free him from bullying. His simple childhood gift of apples and a basket tilted Cezanne's artistic mind. He endlessly painted that image all of his life, bringing all the color, light, shape, and texture to a new artistic movement. Who would have guessed? I will never look at an apple in another way. It makes me wonder about the gifts I give and the ones I receive. 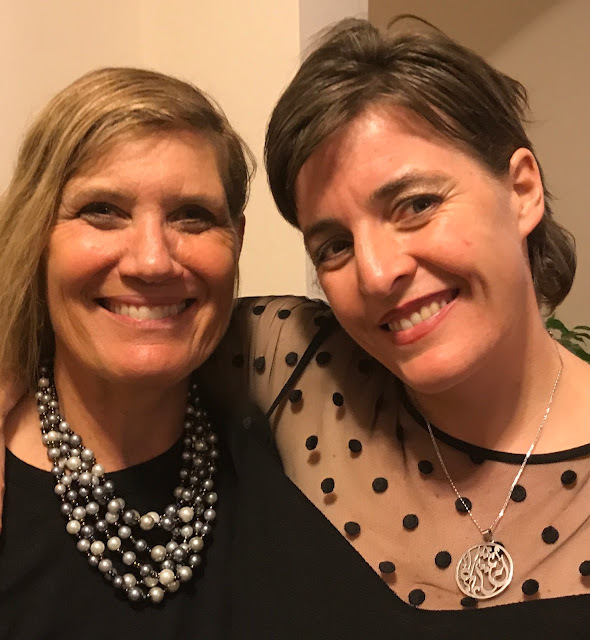 But perhaps most significant to note about the story: the best gifts are kindness and friendship--the refusal to belittle or ridicule another. To live a life that is free of shaming others is one of the best gifts you can give. To Paul Cezanne's great credit, he unknowingly and ultimately gave this gift to himself. Here are some of the props he used for 30 years as he resurrected "the still life" from the Dutch 17th century still life paintings. Cezanne brought balance and harmony to the canvas--despite the topsy-turvy disorder of how he placed things. He was discovering a new trajectory in art. You can wander on a path recounting Cezanne's life, but my favorite was his studio. 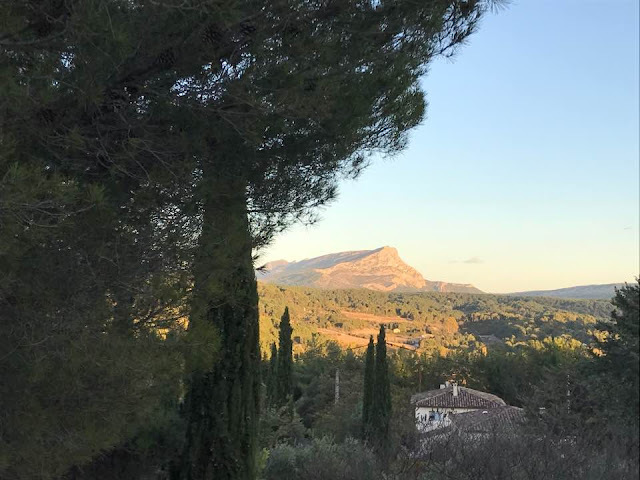 A hill in Aix-en-Provence you can climb to where Cezanne painted his favorite mountain. One of Cezanne's famous still life paintings, typically showing his fascination with apples. Before the game getting ready to cheer for Iceland in Doha, Qatar on November 14. Doha invited some teams for a "friendly" tournament. My Viking hat was a perfect choice to buy when I was in Iceland. I wear it quite a bit these days--for Halloween, etc. I am definitely a Viking to be reckoned with! One of my mottoes that hangs in my house. Since I don't plan on going to Russia for the World Cup to see strakarnir okkar (means "our boys" in Icelandic), I was thrilled to see them play in Qatar this week--on my own expat turf. I am half Icelandic and was proud to cheer Iceland--the land of my heritage. The tiny country of 330,000 recently qualified to play in the 2018 World Cup, beating out Croatia, Turkey, and Ukraine. Let's just say the US, the Netherlands, and Italy did not qualify to play in Russia this year so it is a huge accomplishment. Iceland is the smallest country to ever qualify to play in the World Cup. This week the Icelandic men's soccer team came to Qatar to play the Qatar team. Qatar is the host of the World Cup for 2022, and it was a "friendly" game--a bit of jousting and fun. I guess it was so "friendly" that they tied. Ha! To see the Qatar team who is comprised of six different nationalities, with different accents, backgrounds, and languages was thrilling too. Soccer is their common language. The Icelanders have their famous clap. The Qataris have their famous chants, singing, and drum playing that lasted the entire game. Not far from where I live is the Aspire Academy, a leading training ground in the world to bring promising soccer players to realize their dream. The tiny country of Qatar, roughly the size of Connecticut, sponsors a program called "Football Dreams," which brings in young soccer players from Southeast Asia, Latin America, and Sub-Sahara Africa. Their hope is to bring kids from all over the world to the soccer academy. Their aim? The 2022 World Cup here in Doha, Qatar. After the game, everyone cheering for the tie. Qatar is inviting teams to play, such as Iceland, to bring their global team together. Iceland, the team that has brought a new edge to soccer on the block, was thrilling to watch. They play with a serious, calculated fearlessness that is strong and confident. In a New York Times article, Gudni Bergsson, a former national captain who is now the president of the Icelandic Football Association expressed his views for his country when he said, "It means the world. For years we have watched the major soccer tournaments on television. People would choose their sides and which countries to support. Now we are actually going to the World Cup." I was not the only one to put on a Viking hat to cheer on Iceland. Some other fans from Iceland here in Doha. In a very short time, the small country of Iceland has put soccer on the map. The head coach, a part-time dentist, also adds a piqued interest. In less than a decade, seven new soccer domes have been built, a hundred all-weather surfaces made for schools, with underfloor geothermal heating. World class coaches, and as Bergsson said, his players are "workaholics." Undoubtedly, there will be many people this summer cheering for Iceland at the World Cup. The sports world loves their clap where the crowd and team cheer when they win a game. It's like the Vikings invaded the party. Yes, I think they will be party crashers this year in Russia. I predict the little country of Iceland is going to surprise the soccer world. Watch Iceland celebrate with their win from Kosovo to go to the World Cup with their famous Viking clap: Famous Iceland Clap on the team's return to Reykjavik To see Reykjavik crowd the street for their team and clap. Epic. H. Smith Shumway, at age 21, a year before he landed on D-Day. My father-in-law, Hyrum Smith Shumway, was one of the best friends of my life. If you were lucky to have met him, he would have probably told you a joke or a funny story immediately because he loved to laugh. He could out pun anybody on the planet. If he had his harmonica, violin, or a piano nearby, he would have readily played for you. If he had his bag of magic tricks with him, he would have given a professional-like magic show to entertain you. He was one of the most prolific readers I have ever known. He read a few books a week. But not on the printed page. He used braille and "talking books" because he was blinded in World War II. His sight was taken away from him six weeks after he landed on Omaha Beach on June 6, 1944 when he was 22. His memorable wit and encyclopedic knowledge of 1930 and 1940 songs were legendary. His 67 years of darkness only turned him into a man of remarkable inspiration and hope. He did not consider himself amazing or unusual. He only wanted to be independent and live his life with purpose and value. Even in his later years, he scaled climbing walls and repelling courses in his 70's, went cross-country skiing, hiked mountains, won jitter-bug contests and swam several miles a week. Living in darkness did not derail him. I heard him often say, ""I might not have sight. But I have insight." Smith Shumway lived life with immense cheer, hope, and laughter--despite his blindness. Somehow as a passenger on the Queen Elizabeth ocean liner (a converted hospital ship) bound for America from England to take him home from the war, he committed to living a full life that knew no limits. Being blind would dramatically change his life, but not his resolve to be happy. Grandpa Shumway, as he was called by hundreds and perhaps thousands of people, was a man of great faith in God. He truly never doubted his ability to make a difference. After marrying his college sweetheart, they raised eight children--seven daughters and one son. His family now has nearly 100 great-grandchildren. He spent three years in rehabilitation--starting in a makeshift tent hospital in Normandy after he was hit by a landmine, then on to several hospitals in England, and eventually for two years in the United States. One nurse told him she had never seen so much shrapnel in one body. He received the Bronze Star, the Purple Heart. At the end of his life, he was knighted and given the French Legion of Honor, which is the highest award the French government gives. In 1996 we brought him back to Omaha Beach for the first time since he had landed on the beach and climbed to secure the beachhead. As we walked together on those sandy beaches over 50 years later, the seagulls chirped and flew over us. With the tide washing our feet, he continually spoke of the quiet and peace on the beach. Although he had not been on the beach for 52 years, he knew which direction he was on the shore. He could even point, with accuracy, the pillboxes on the hill and a small church steeple on the horizon, that must have been landmarks for him. Grandpa Shumway helped to liberate a half dozen French villages--with people who live there now who are our close friends. His legend lives on in Normandy and every time his life story is told again. In the English language, the word souvenir is a noun that means to bring home a keepsake, a token of sentimental value. But in French, the irregular verb, se souvenir, means to remember. Grandpa brought home a lifelong souvenir from the war, but losing sight caused him to remember how to live an abundant life. He considered himself blessed. If you saw him, you would never have forgotten his light-filled face. He is my favorite veteran because he causes me to remember how to live with joy and faith--no matter what happens. Happy Veteran's Day Grandpa. You will be remembered always! I was born in Salt Lake City, Utah on November 27, 1921. When the USA entered WW2 in 1941, I was 20 years old. After graduating from college and wanting to go to medical school, I joined the army instead. Everyone wanted to be part of the war effort. On June 6, 1944, I was a 2nd Lt, and an infantry platoon leader in the First Army Division, 18th Regiment, Company B. My unit was assigned to land on Omaha Beach, in the section called "Easy Red", in the second wave. We rushed down the ramp of the LCI 9landing craft) into water about knee deep and ran up to the beach to re-assemble there. There were dead bodies floating in the water and many on the beach. Some tanks had been hit by artillery. The confusion on the beach made it impossible for me to get my bearings. Death and wreckage were everywhere. German mortar shells were still hitting the beach. The noise from the planes, boats, artillery explosions and gunfire was almost unbearable. There was a red-headed fellow with a very white face looking up at me in a kneeling position beach. I stepped back from the sight, and was given a push by a man kneeling on the ground behind me. He yelled, "Do you want to get us both killed?" He was in the process of disarming a land mine. I gestured and muttered something about the red-headed fellow in front of me. The soldier exclaimed, "Don't worry about him. He's dead. Just watch where you put your feet." I then came out of my daze, and was very alert to everything around me. Before we went over the top of the hill, I looked back and contemplated the scene before me. Hundreds of ships and boats were circling in the Channel. LDI's and LST's were landing men and tanks. Planes were soaring overhead, big shells bursting on land and sea, and the beach covered with men and machines. I thought of the millions of dollars and thousands of lives being spent to wage war and the tragic cost and horror of it all. At the top of the hill. we had to cross a minefield, after which we dug in for a counterattack that never came. For the next several weeks led my platoon, moving forward during the day and digging foxholes for the night. It was very tedious fighting from hedgerow to hedgerow. After about six weeks, we dug in and held the line. Le Tronquay, France, the French village, where Grandpa helped to liberate. The mayor Patricia Gady Duquesne, who helps to remember the veterans who died and fought in her village. There is a plaque in the center of the town that shows Grandpa as the "esteemed citizen of the village." Finally, our unit was relieved from the front lines and allowed to rest for a few days. I was able to take my first shower since D-Day. It was wonderful! One day after I was relieved, the man who replaced me in my foxhole was killed during a counterattack. At that time and following several other close call encounters with death, I felt that my Heavenly Father had blessed me and spared my life for a reason. Le Tronquay, France where the people of the village still remember the veterans who fought in their village. Each year a picnic, ceremony, and festivities are planned in most towns in Normandy to remember the men who fought and died in these villages. 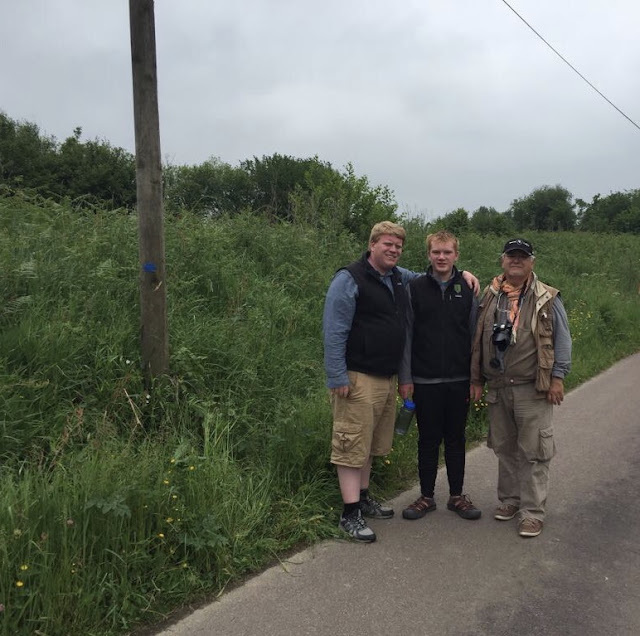 On July 27, 1944, a few miles to the west of St. Lo, my life changed forever. I was walking on a narrow sunken road bordered with hedgerows, about one meter behind the tank. Suddenly a horrible explosion occurred, which I learned later was due to an anti-tank mine. Immediately everything went black. I thought, "Something has happened to me and I don't know what. But I will be okay in a second." There was a steady, strong current of air hitting my face, chest, and legs. I seemed to hang suspended. There was a deafening sound that just kept ringing, and it seemed as if it would never stop. Finally, however, the strong current of air and the explosion died out. It started to get very weak all of a sudden, and I collapsed on the ground. It occurred to me that one of my legs might be blown off so I used my left hand, which later proved to be the only part of my body that wasn't hit, to feel my legs. My right thigh was bloody. My left kneed was bloody. My right hand, which had been holding my carbine, was just numb. It was all bloody, and whether it had some fingers missing or not, I neither knew or cared right then. My chest was starting to hurt. Feeling it with my left hand, I knew it was a bloody mess also. I couldn't see so I naturally felt my face. It was bloody also. I wondered had been stunned at first, but now the pain was engulfing me. My aid man, Private Nonamaker, was standing by me then, and how he got to where I was so fast, I never knew. Someone asked why he didn't give me morphine. He replied that he couldn't give it to anyone with a head injury. He said, "How are you, Lieutenant? It's not so very bad. You'll be okay. It always seems worse than it really is. " He kept talking to me in this same manner all the time he was sprinkling sulfa power and dressing my wounds. The pain seemed lessened when the sulfa powder was administered. He was the best aid man I ever knew. I guess I had lost a lot of blood by now because I suddenly became very cold, and asked for a blanket, which was immediately taken off the tank and thrown on me. The pain which had been getting worse stopped a little as my body started to get cold and my arms and legs became numb. I kept wondering why I didn't pass out, and I sincerely wished I would. could still breathe well, I knew I wanted to live. I was filled with hope that I wouldn't die because I could still breath. I remember spitting quite a bit when my aid man came up. There seemed to be fine gravel in my mouth. And after a few seconds of thought, I decided it was my teeth. It was very hard to say anything because there seemed to be a small hole for my mouth, and I couldn't breathe through my nose. My tongue and face were pretty badly swollen, what was left of them. I remember pleading, "Don't cover my mouth with a bandage, or I can't breathe." When no one seemed to be around me, I said, "Somebody say something. Keep talking." The last thing I remember was calling out my concern about the landmines. Then oblivion came. I woke up in a field hospital on the Normandy coast. The realization that I was permanently blind came slowly over the next few days. I asked the doctor, "Please tell me what chances there are of my left eye being all right?" (my right eye had already been declared inoperable). He hesitated, then said, "With my experience, I would say about one chance in fifty thousand." Then I knew he had been trying to let me have it slowly. They told me my right eye would be removed, both legs cleaned out, with shrapnel removed from my chest, my chest sewed up, and my hand fixed. I asked for some Mormon elders (from The Church of Jesus Christ of Latter-Day Saints) to come to visit me so I could receive a blessing before the operation. None were available so I asked for some olive oil. Due to wartime shortages, this request was impossible also. They brought me some mineral oil, and I anointed and blessed myself as best as I could. This brought me much needed peace of mind. In addition to blindness, I had lost the right side of my chest, my calf and thigh muscles from one of my legs, and I had shrapnel over my entire body. Some of the shrapnel has been slowly working its way out of my body for over 50 years! I still occasionally get a painful boil on random parts of my body. When it pops, they invariably find a fine metal speck, like a grain of sand. To this day, I consistently trigger the airport devices. Following the injury, I spent the next two years in a variety of hospitals and rehabilitation centers, recovering from my wounds and adapting to life as a blind person. In 1946, I was hired as a rehabilitation counselor in Baltimore, Maryland for the Maryland State Department of Education. In this capacity, I visited factories and demonstrated to both factory managers and blind people that a blind person could perform a particular task. Often the blind person was more difficult to convince than the factory manager! H. Smith Shumway, at age 23, in Wyoming when he is back from the war. His hope and confidence never languished, at least for long. His mother taught him, he later said, "Believe in yourself, and the world will believe too." I don't think she would have ever estimated her influential words on her young son. Once I had proven to all concerned that a blind person could do the job, I was then replaced by one of my blind clients and I went on to the next "opportunity." Over the course of the next several years, I qualified many jobs for my the blind. I was told that I was "leading the nation" every year for ten years, in terms of the number of jobs qualified by a blind rehabilitation counselor. After gaining the personal self-confidence that I could hold a job and support a family, I proposed to my college sweetheart, Sarah Bagley. I asked, "If you'll sort the socks, read the mail, and drive the car, I will do the rest." She accepted, even though her parents tried to discourage her from marrying a blind person. Ironically, in later life, my father-in-law became blind himself, and I helped him adapt to his new circumstances. Smith and Sarah Shumway's wedding on September 1, 1948. Sarah knew how to encourage and support Smith, allowing him to feel independent and confident. He did much the repair for the house, the plumbing, painting, retiling the bathroom, etc. Nothing ever deterred him. We were married September 1, 1948 in the Salt Lake Mormon Temple. My wife and I had eight children--seven girls and one boy. I would always joke by telling people, "I have seven daughters, and every daughter has a brother." He would pause, and hear them audibly gasp, "Fourteen children?" With a smile and chuckle, he would then reply, "No, not fourteen. They all have the same brother." Smith and Sarah, and thier seven daughters and one son. 1974--Smith and Sarah Shumway in Casper, Wyoming at the Lion's Blind Camp that he founded and ran for 40 years. Grandpa lived with us for close to seven years while we raised our children. He gave WW2 talks in the community, played games with the kids, listened to endless recitals, attended hundreds of games, gave magic shows for birthday parties and Cub Scouts, and was the all-round cheerleader for our kids and everybody else's children too. My son, Jonathan, told him the last time he saw him, "Grandpa, you were not only a grandpa. You are one of my best friends." And all his grandkids could say the same! H. Smith Shumway died at the age of 89 on March 26, 2011. The Story of The Big Red One By Mitch Quiles, from Volx, France. The Big Red One was sent from Sicily to England to prepare for Operation Overlord or D-Day. Under the direction of Major General Clarence Ralph Huebner, they, along with the 29th Division, were responsible for the invasion at Omaha Beach. The resistance was fierce, and the Americans were on the verge of a catastrophe. The losses were immense--approximately a 95% casualty rate for the first officers hit on the beach. But the veterans of the North Africa and Sicily campaigns, mixed with new reinforcements, maintained their composure and forced open the Atlantic Wall, defended at Omaha Beach by Germany's 352nd Infantry Division. General Taylor, Commander of the 16th Infantry Regiment of the Big Red One, uttered the famous phrase to rally his troops, " There are only two types of soldiers on the beach--those who are dead and those who are going to die. Now get going up the hill." 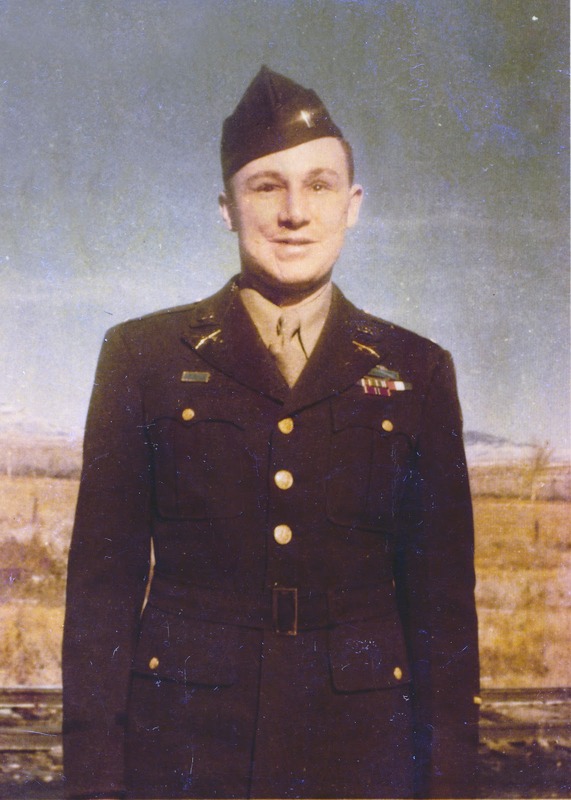 On June 6, 1944, Lt. Shumway was part of the B Company, 1st Battalion, 18th Regiment. The 18th Regiment was supposed to hit the beach at 0930 hours, but because of the difficulties encountered by the 16th Regiment, their landing was delayed until about 1300 hours. During that time, the artillery from the naval warships was able to neutralize much of the German defenses, although German artillery continued to land on the beach as the 18th Infantry came ashore. This explains why the B Company suffered relatively few casualties on D-Day. On D-Day, the 1st Division lost 1, 744 men, while the 29th Division lost 2, 240. Rapidly over the next six days, B Company pressed forward and liberated in succession Colleville-sur-mer, Formigny, Le Tronquay, La Commune, Caumont L-Evente, and La Vacquerie. During the six weeks that B Company held its frontline position at La Vacquerie, B Company last ten of Lt. Shumway's comrades in arms. Following the six weeks at La Vacquerie, B Company was removed from the front lines for one week, about ten miles behind the lines at Bernesq. On July 27, the first day of the Breakout or Operation Cobra, the 1st Division liberated the towns of La Chapelle-en-Jugar and Marigny to the west of St. Lo. As they passed through this area, Lt. Shumway was seriously wounded by the blast of an anti-tank mine, triggered by a Sherman tanks attached to his B Company. He has been a living example from Omaha Beach until today, of the motto of the Big Red One: "Duty First." Elias, my son, with autism, who was about to give his talk. Kristopher, a fellow parent, also with a son with autism, is now a good friend. When you discover your child has a disability, your heart prints are changed forever. Suddenly, the terrain and landscape are different. The roads can appear confusing, mystifying, and sometimes even blocked. Fog can descend in patches along the way. 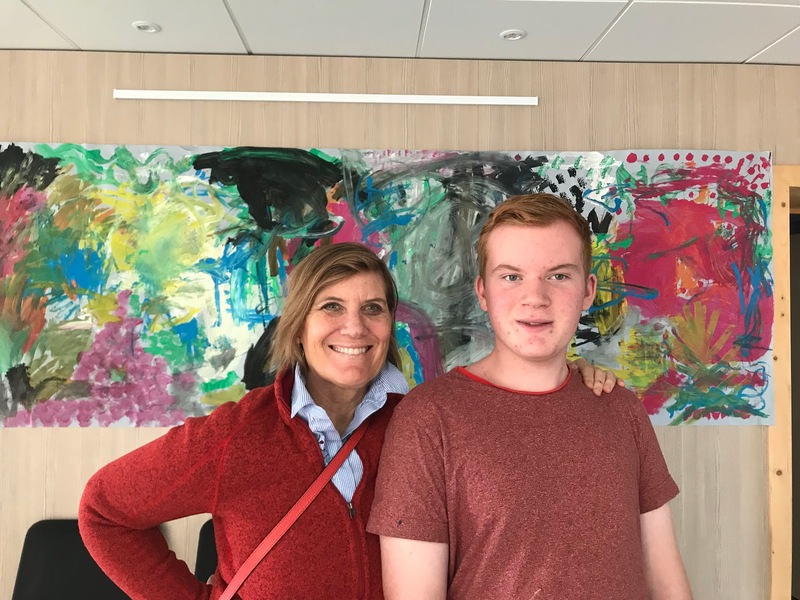 Just as the "Cape of Good Hope" in South Africa was initially once named "the Cape of Storms," the beginning of my journey with autism seemed wracked with larger crests than I thought I could surmount. As old-world explorers saw a new vision for their seafaring voyages to Asia, India, and the New World, they decided to give The Cape a new name: "the Cape of Good Hope." They began to dwell in the art of possibility. Instead of only seeing treacherous waves and unanticipated storms, the explorers focused on hope and optimism. They believed wild, churning waves could bring them to beautiful and undiscovered lands. The choice? Get stuck or let the wind bring you to magical places. I believe that we must all change our trajectories, paradigms, definitions, labels--wherever life's journeys take us. I could never have predicted the initial wild autism waves could bring me to incredible places and people. This year our son, Elias, who has autism, and I were invited to Provence twice to talk to educators, teachers, administrators, and parents. 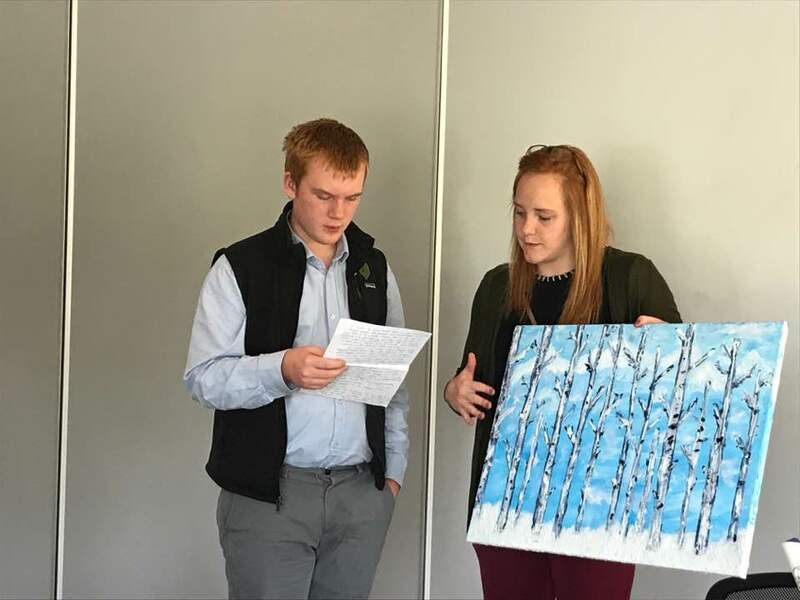 They asked him to bring a painting for the Manosque, France Orange and Blue Autism Centre. Meeting, working, talking to the people of Provence who work daily with children and families with disabilities has transformed my life. As Leigh Hunt has said, "Traveling in the company of those we love is home in motion." 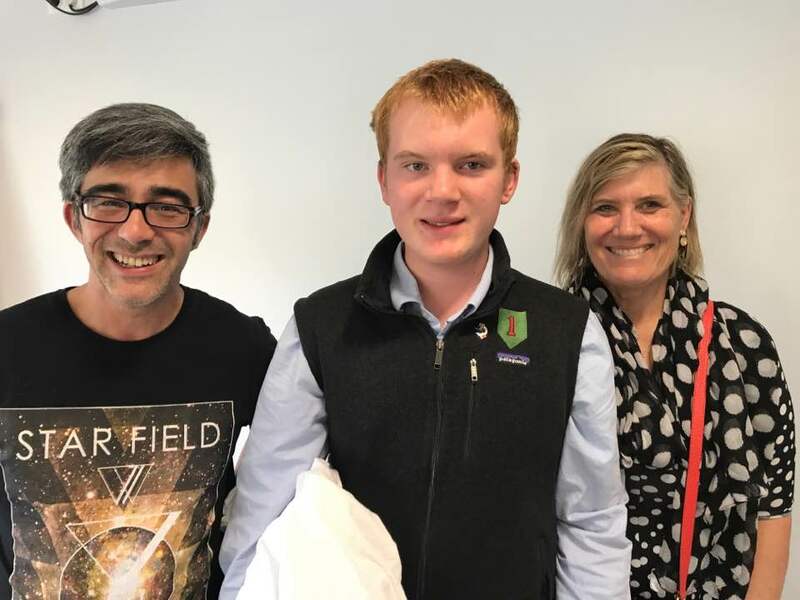 I have a new home in France with people who passionately care about children and families with disabilities. My former storms are no more, and instead, I chose long ago to see the beckoning possibilities. Natalie, Elias's cousin, helping to translate his talk for him, and presenting the picture to the autism center. "I want to talk about how I love art. 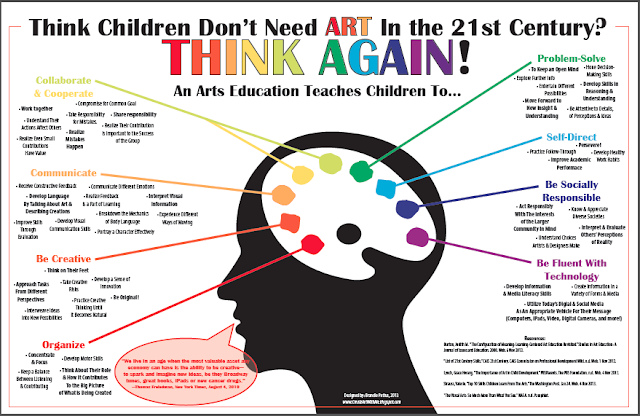 I had a teacher named Mr. Gabriel who encouraged me to learn how to be a better artist. He let me try new projects like printmaking, painting, and splattering paint drops like Jackson Pollack. My teacher helped me to learn how to create and express myself with paint, paper, and clay." "I want to help other people with special needs like me. I want everyone to stop and create more. It makes me happy when I do art and when I see others doing art too. My mom and I have started a foundation called Art4Every1. We want to have everyone do art in hospitals, refugee camps, schools. I know I am happier when I do art. I can see new shapes and patterns. I can see colors mixed together. I can see the world in different ways. I love nature, and I like to paint what I see." "I want to go to art school someday and keep on getting better. I want to teach other people to be happy when they do art. The painting that we choose to paint for you here is blue because the color of celebrating autism is blue. It is a winter scene. My mom and I listened to Vivaldi's winter music when we painted it. The mountains are in the background. And it shows a forest of trees. This picture means that you keep going and climbing to the mountain, and not to get stuck in the trees and fog." "My other project is a collage of the ocean and sand that I did with my art teacher, Anny Ku, in Qatar. I painted small pictures with acrylic paint on them and put them together like a mosaic. It took me about four or five hours to make. It looks like a tsunami to me. There are lots of patterns in the ocean layers." "I am so so glad I could come and talk to you about art. Thank you." I have become part French. I am forever changed by the French people whom I have met in the last few years in France. I have started learning French. I could never predict or expect this incredible journey. As a young college student, I only saw the more visible beauties in the Louvre, a crepe, or the Notre Dame. Now I see the splendor and awe so much more when I go there. I get to be revitalized with some of the people who are on my autism journey with me, my fellow-travelers. Thank you, France, for inviting us in--to come on the art journey with you. I am not so dim to realize that my journey with my art partner, my son, Elias, is what got me here in the first place. The storms of long ago have rewarded me with so much hope, so much joy. I have been in many happy places and lands with him that I would never have ventured otherwise. Storms bring hopeful rainbows. A teacher who came to hear our presentation. 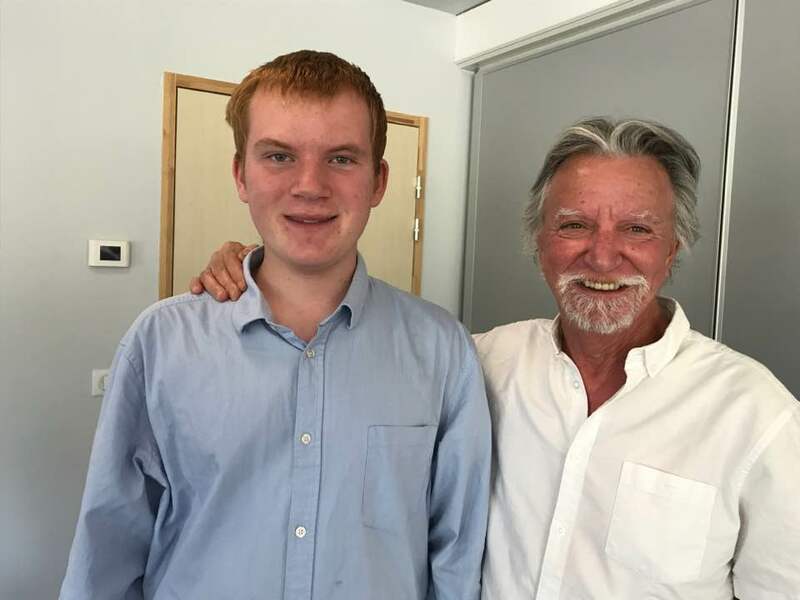 In May, Elias with Emmanuel Charot, the Chairman of the Organization for children with Disabilities called A.D.A.P.E.I. Some of the many reasons why art education is so important--for both typical children and those who have a disability. In the Orange Blue A. D.A. P.E. 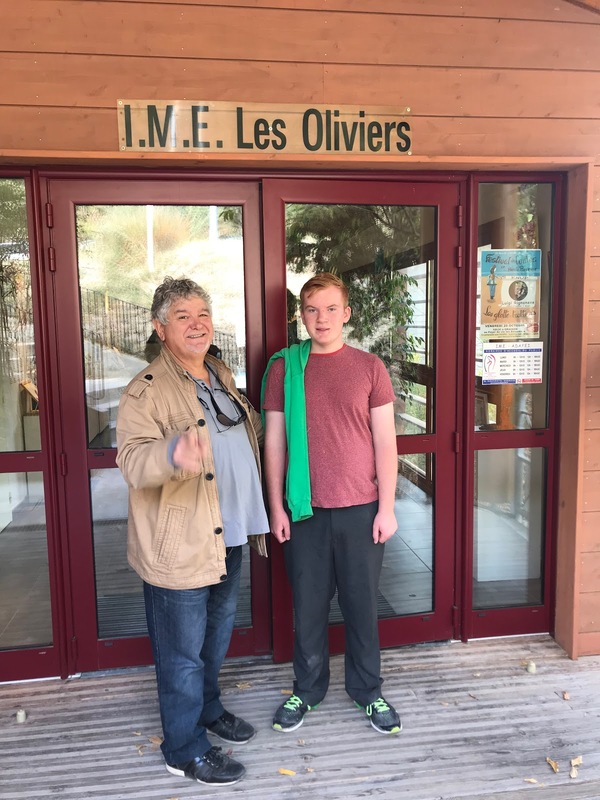 I School in Manosque, France--a setting that I have learned so much from. Every detail has been thought out in the school and for the children. It is a happy place that prepares them for the future. I was so happy in this art room, that I didn't want to leave. 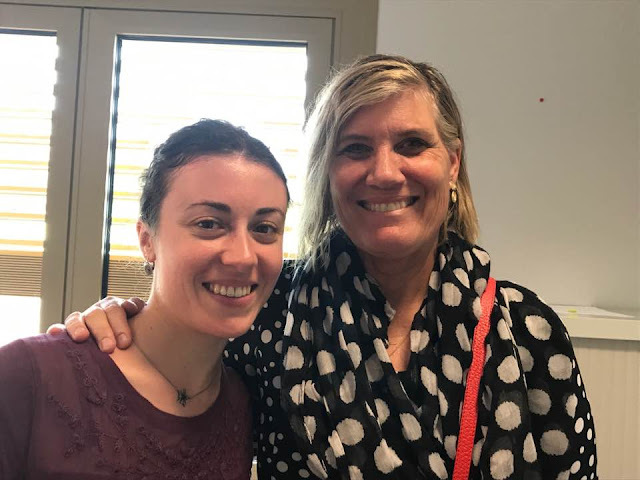 Marie, the art teacher, told me she has a family member with a disability so this is the reason she decided to become an art teacher for children with disabilities. 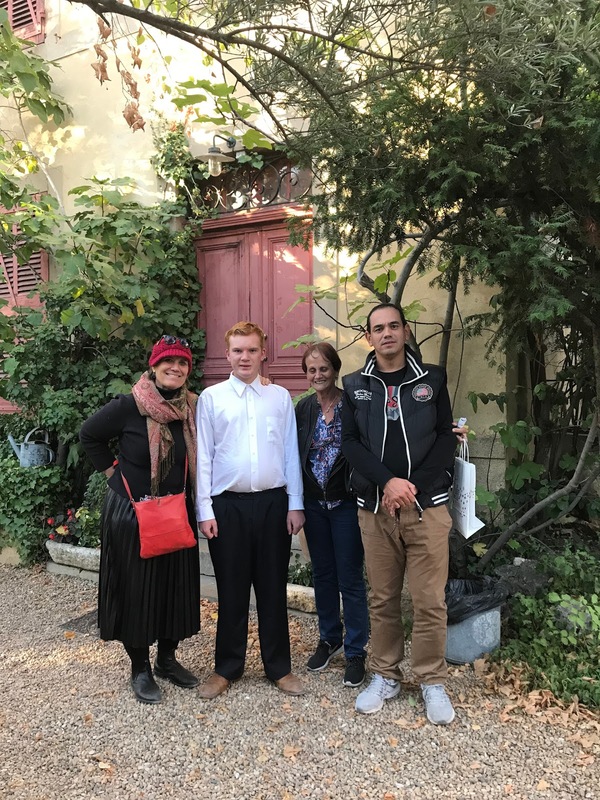 Mitch Quiles, our dear friend, who made it all possible that we could come to Provence to meet and connect with the A.D.A.P..E. I teachers and administrators. Mitch has a son with a handicap so he is very involved and on the board for A.D.A. P.E.I. in Provence. Elias and I didn't want to leave the art room because it felt so creative to be there. 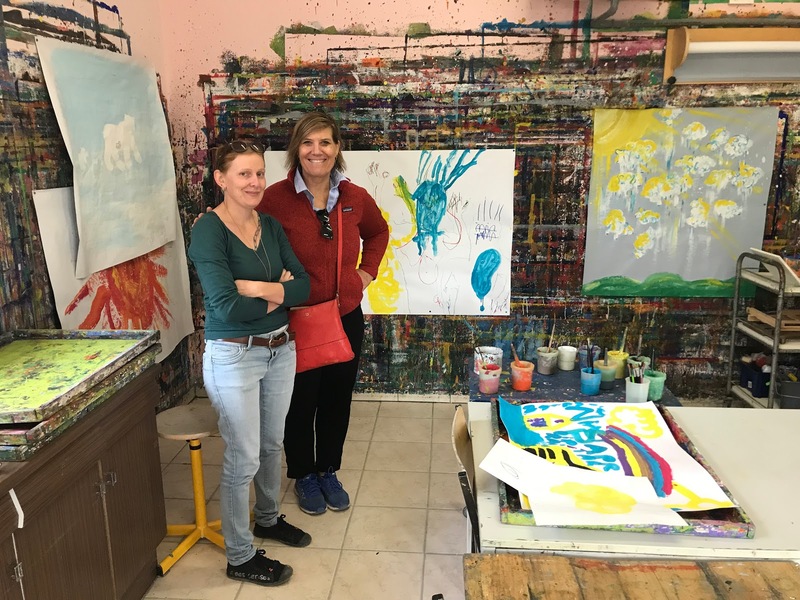 Marie, the teacher, has an amazing facility for the children to create. It was just such a delightful room, inviting and joyous to all. Some of the great things that the A.D.A.P.E.I. organization is doing in Provence. Translation for the article: A great reward for the young people of the Instit Medico-Educatif. We made an impressive mural of 90m2 with the students of the school, "Les Plantiers: and the Club Altitude of Sisteron. Our fresco has just been selected for the Olympic Games in Pairs. It is a pride for us to have led all these artists in herbs in a great adventure. Adventure that is just beginning. This fresco realized on canvas, is exposed in various places over the demonstrations in the Laure et Marie Plastic Arts Workshops. Instructors and educators were able to perform feats with the group of young people who spoke during these intensive moments of creativity. France is leading the way, in my opinion, to help children who have disabilities and their families. It is critical that children and youth with disabilities feel purposeful and prepare for the future. In my work in Qatar with children with disabilities, I see that these children need to feel successful and their lives are of value. When children with disabilities feel their worth and validation, we are all strengthened. When we help to enrich their lives, we too are better. We learn and know things we would have never known, which elevates us all. The world is kinder, more humane, and listening to every voice. And sometimes when there is no voice, art is the way they can speak to us.
" In a gentle way, you can shake the world." Katrin Meingast, our Doha Diva, from Dresden, Germany. 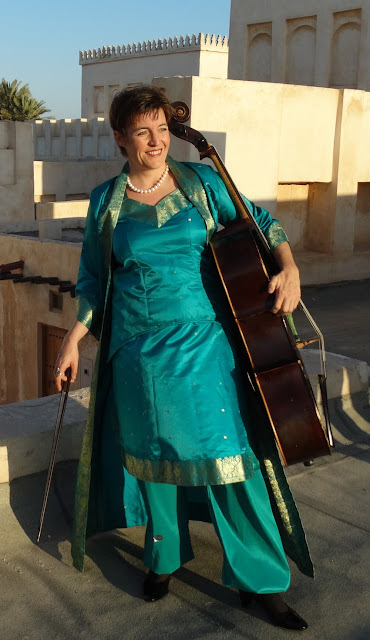 Katrin was my cello teacher for about two years when I first moved to Doha until she moved back to Dresden a year ago. Since I was her student, I was invited seamlessly into the Doha music scene, which is rich with wonderful musicians. 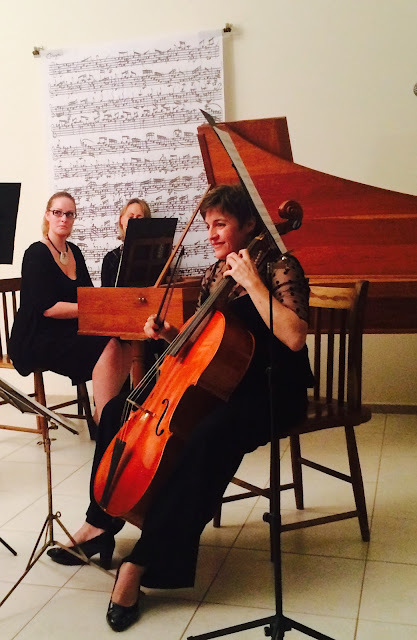 She launched The Baroque Ensemble, with players who play the Baroque style with Baroque music. At the German School, she began music classes after school for the children--arranging music teachers to come and teach. After a few short months, she began an orchestra with the new musicians. She organized The Baroque Chamber Group, and helped with the Children's Concert Choir here in Doha that is directed by Alena Pyne. Her handprint on Doha's music scene was every where.when she left. Yet, curiously her passion for gathering people together to play and listen to music lives on here with us. The monthly soiree musical gatherings she began at her home now continues with others taking the lead. From her influence, I started our own soiree gatherings in our home--one of the best things I have ever done. Here is a blog I wrote about it: A Musical Soiree Anyone? What happens when one person is inspired to change the culture they are living in? How does the landscape change when one person decides to organize and collaborate to insert their vision? How does one person spark influence that others seek to follow? And how does one person see three steps ahead of what the present reality is? To see how one human being's influence can ripple is hearteningly hopeful. To look upon your talents, even if you think they are meager, and be willing to share, that is wondrous. I am endlessly fascinated how one person can make a difference in a community and in the world. The cellist is usually a supporting actor role--not the shining role--except for Yoya Ma, and a few other notable cellists. But Katrin elevates the utility and sonorous sounds of the cello to another level for the listener. Since she loves music so much, especially Baroque, she gathers singers, other string and wind players, even percussionists to play together. At her home in Doha when she lived here, a harpsichord donned her living room. Somehow any musician that was flying over Doha, she persuaded to come and play in her home. When she was here, Katrin was always organizing another musical group, gathering, or event. We all felt lucky and blessed to be transferred to other places with her at the helm. "I have one life, and one chance to make it count for something. . . . My faith demands that I do whatever I can, wherever I am, whenever I can, for as long as I can with whatever I have to make a difference." His conviction to make a difference is my resolve too. One star at a time will light the sky. 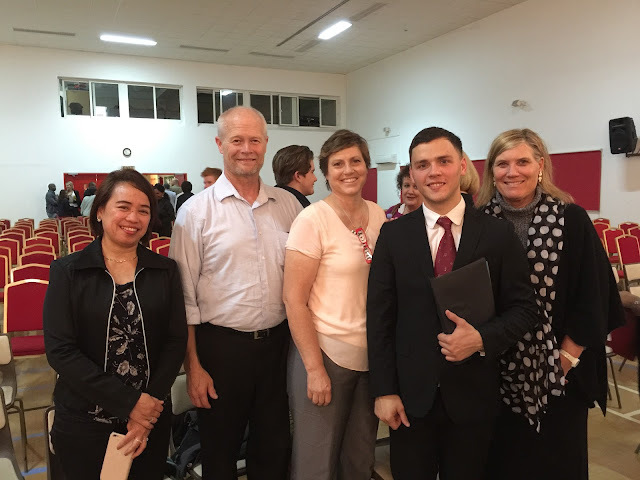 Herman, from Ukraine, our friend, who sang in Handel's Messiah. Katrin, accompanying the Children's Concert Choir in Doha. 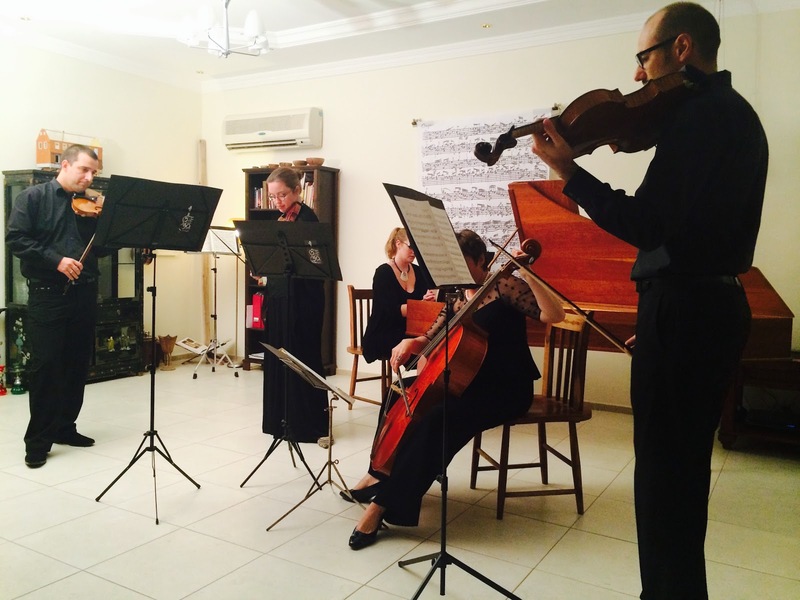 At her home in Doha, with a harpsichordist from South Africa accompanying her. The Baroque Ensemble who played together when she lived here. The other musicians play in the Qatar Philharmonic Orchestra. 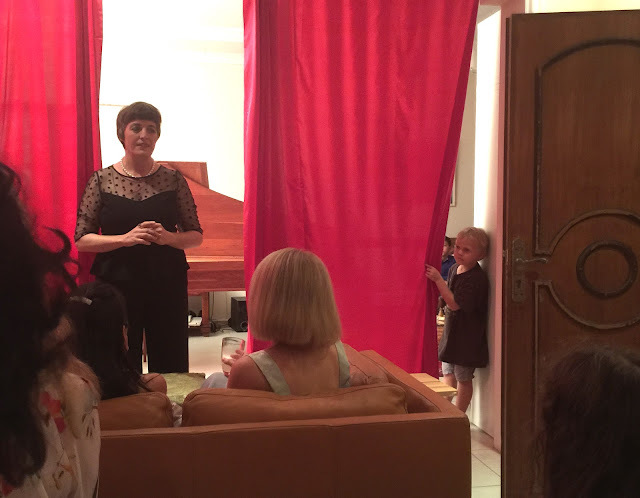 Katrin put up a red curtain for the soirees that were held at her home. Her daughter is about to pull the curtain for the magic to begin. Candles were lit, everyone brought food for the occasion. Sometimes a cat would walk across the stage (her living room). The setting was a home, but the music was heavenly. 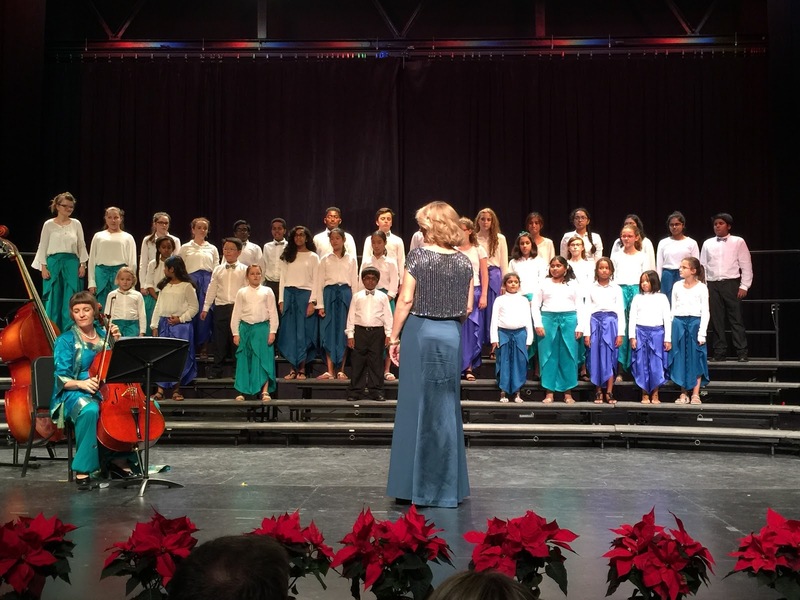 And somehow Katrin, the cellist, or Doha Diva, was able to gather musicians from all around the world to perform. And we, the eager expat community loved every minute--linger memories to savor forever. Friendships were made as we all gathered each month to enjoy the music together. And all because one lone woman wanted to share her music with us. Thanks Katrin for teaching me how to play the cello better, but also to see your example of how to make the world better with music. Gathering musicians who are on any level of skill is now a personal passion with me too. To see children who practice all month so they can perform here in Doha at my house makes me very happy.